As regular readers know we are heavy users of Basecamp. This month is the first time in a while I'm not happy about our subscription as we've had to move up to the Elite Suite at $249 month as we've run out of Basecamp projects at 100 (we've been rotating them for awhile but five more projects came in and there just isn't space). For those who are counting, that's $3000/year for a software subscription. Basecamp uses Textile as the main editor (well 37signals have added some kind of WYSIWYG editor lately but for those of us writing messages, comments and writeboards for the last seven years, Textile is in our blood). So what I want to be able to do is write all my posts and drafts in Textile and then convert them to html for publication (saving the original in Textile for further editing). For a while I used iTextile a wrapper around a Python script. It worked pretty well but was kind of ugly and not customizable. I gave up on iTextile due to ergonomics. When I went to fire it up again yesterday, it turns out iTextile is PPC only and requires Rosetta. On my most recent machines, I've managed to get rid of Rosetta completely so I was warned about installing Rosetta. I'd prefer not to have the emulator overhead hanging around waiting to steal memory and cycles, so I said no. There is an interesting application called MarkMyWords from xelaton.com in Germany. MarkMyWords allows you to write in the mark up language of your choice (important ones include Markdown, Textile, BBcode and Wiki syntax) and get html out on the other end. Preview is live which is very cool. MarkMyWords does what it promises very well and even includes full screen and distraction free modes. 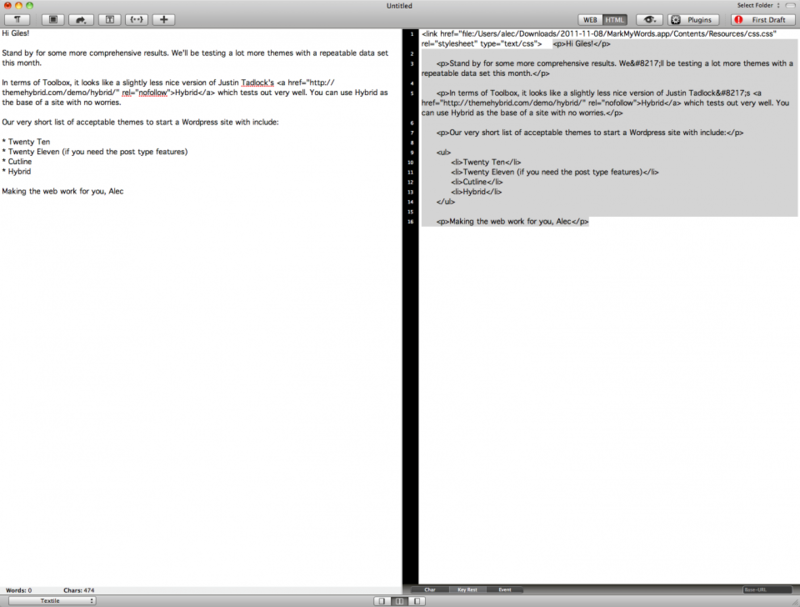 If you are looking for a new text editor, MarkMyWords has a lot to recommend it. The icon is fussy and ugly. At this point, I was thinking what I really need is to get Textile into BBEdit. I don't know why the BareBones guys have been so lazy about adding a Textile module themselves. Apparently there's been Markdown syntax for a long time. download our Textil.sh filter from Github. 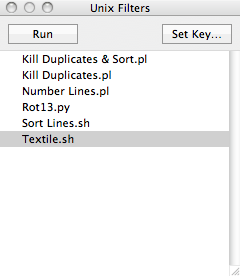 you will get a folder with a file with this name in it: "Textile.sh"
Our version also won't convert single and double quotes to HTML entities. This should be an option in the original version, hopefully our changes get into Github.com soon. Bingo, you now have full Textile writing inside of BBEdit at zero cost. Apparently this filter will work for other text editors which accept php filters (TextMate among others) but I can't provide step by step instructions as BBEdit 8.7.2 is my weapon of choice. I may still buy MarkMyWords as I have something of a fetish for text and html editors (own at least ten of them) and earn my living writing and coding. $25 for another work tool is no big deal. But I wouldn't encourage it's adoption across our company as that would be $200 for what most people wouldn't use nearly enough. Our programmers will be much happier with a working php script. On the other hand, Textile.sh doesn't require me to change my workflow at all. This article full of ordered and unordered lists was written in BBEdit and Textile.sh with no issues. Marked does not get a review here as Marked is AppStore only. I will not sign into or buy anything from the AppStore or even let it run on my computers (the AppStore is effectively a back door). In search of a good CSS Editor with FTP editing on Windows: BBedit Equivalent?